For the past decade we have been fascinated by the unique nature of Lake Worth Lagoon (LWL), in particular the area at and adjacent to Blue Heron Bridge, and so have documented the diversity of the fishes by maintaining a working list of species documented from the waters of LWL. Because we are first and foremost naturalists, our attention often wanders to other biota and we are tempted to produce similar lists for other local faunal groups. As collection-based biologists we have been taught, of course, to demand tangible proof of occurrence, either through curated museum specimens or by photographs. Even records from scientific papers are looked at with scrutiny because, believe it or not, not all biologists are great at identification. Thus, we are kind of persnickety in wanting to personally verify identifications, but in deference to the many bird watchers of the region and in the initial paucity of photographs, we will accept undocumented sightings or vocal identifications from trusted sources. 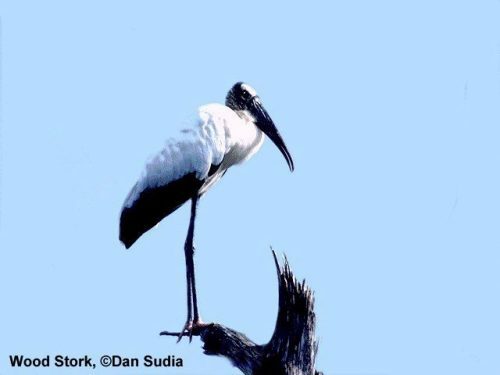 To get the ball rolling we have produced a list of Palm Beach County birds (minus extinctions) – we are sure to have missed some rare county species, mea culpa, but the intent here is to offer up the most likely to be encountered LWL birds. The list is presented in taxonomic order, the standard scientific format, as a learning tool for more casual viewers – from this order one can appreciate evolutionary relationships. Taxonomy follows the most recent American Ornithologists’ Union (AOU) list and county records, breeding status, and seasonality are derived from Stevenson & Anderson (1994.The Birdlife of Florida) and Kale et al. (1992. An atlas of Florida’s breeding birds). Obviously not all of these species occur in the area, but the development of a “potential species” list is intended to foster interest in “filling in the holes” on what is now an all but clean slate. Hopefully, the expanded list will prove useful to photographers as it also will serve as a defacto “life list” for each photographer shooting in the area. Because we are always happy to see (and post in our Image Gallery, if given permission) photos, especially those documenting different sexes, color phases, size classes, and behaviors, and there’s always a “better shot,” please don’t feel disinclined to forward your shots just because others have already “checked off” the species. We’d love to see everyone’s initials after each species! We’ll update this list periodically – thanks for all your contributions. Species occurring in LWL verified by museum specimens or photographs forwarded to the Florida Museum of Natural History are marked as ‘verified’ and “potentials” remain unmarked. Contributing photographers are credited for each species they have documented using the acronyms below the table. Anseriformes Anatidae Dendrocygna autumnalis Black-bellied Whistling-Duck SpSFW B? Anseriformes Anatidae Aythya marila Greater Scaup F?W? Anseriformes Anatidae Mergus merganser Common Merganser W? Pelecaniformes Ardeidae Botaurus lentiginosus American Bittern SpSFW B?? Accipitriformes Accipitridae Elanoides forficatus Swallow-tailed Kite SpSF B? Apodiformes Trochilidae Archilochus colubris Ruby-throated Hummingbird SpSFW B?? Falconiformes Falconidae Caracara cheriway Crested Caracara SpFW B?? Psittaciformes Psittacidae Amazona ochrocephala Yellow-crowned Parrot U B? Passeriformes Vireonidae Vireo olivaceus Red-eyed Vireo SpFW B?? Passeriformes Vireonidae Vireo altiloquus Black-whiskered Vireo SpSF B? Passeriformes Hirundinidae Riparia riparia Bank Swallow SpSFW? Passeriformes Hirundinidae Hirundo rustica Barn Swallow SpSFW B?? Passeriformes Turdidae Catharus ustulatus Swainson's Thrush SpFW? Passeriformes Mimidae Mimus gundlachii Bahama Mockingbird Sp B?? Passeriformes Cardinalidae Piranga rubra Summer Tanager SpSFW B? Passeriformes Cardinalidae Passerina cyanea Indigo Bunting SpSFW B?? Passeriformes Icteridae Sturnella neglecta Western Meadowlark W?